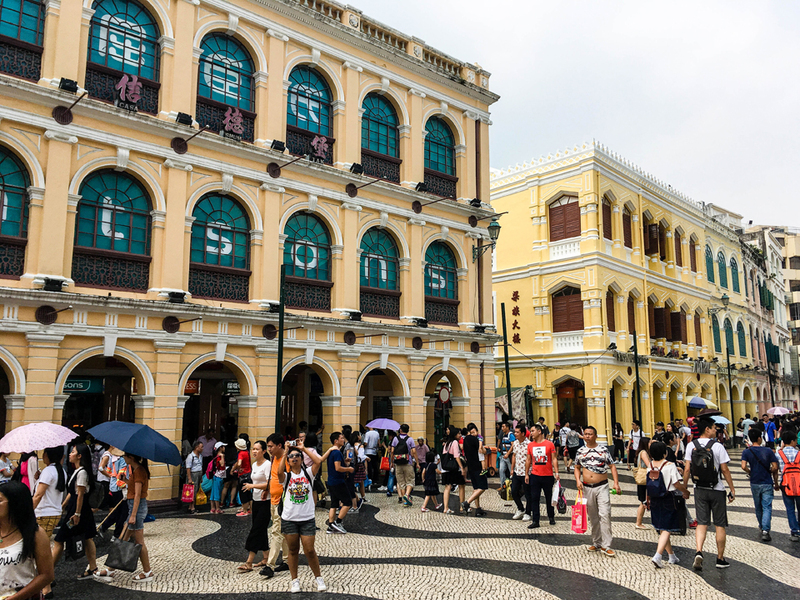 Want To Know How To Do Macau In Just 8 Hours? Macau, a country that’s usually more often referred to as “Vegas of the east” or “that place near Hong Kong that isn’t China”. I had been in Hong Kong for nearly a week and finally decided that I needed to get my day-trip to Macau in before heading to Taiwan. So the night before leaving I did some map studying and spent some time figuring out how to get there and back and also pass through immigration 4 times in one day without any legal hassles. I would be leaving all my belongings in Hong Kong while I visited Macau, so this was something I needed to confirm. I would be visiting another country with literally the clothes on my back, wallet, phone, passport, and nothing else! Would I get back into Hong Kong without any issues, or would I be stuck? Random Fact: Portuguese and Cantonese are the official languages of Macau. I woke up the following morning and grabbed a quick breakfast and took the subway to the docks. I wasn’t sure what to expect from Macau, it’s a country in the same sense that Hong Kong is a country, they are both considered a Special Administrative Region. So while both Hong Kong and Macau are “owned” (in a sense) by China, they aren’t “part” of China, they have their own governments, flags, currencies, and customs. So if someone says they’re from Hong Kong or Macau, don’t correct them by saying “Oh, you mean China?” I bought my ticket for the ferry and passed through immigration out of Hong Kong; this is a common practice for many visitors to Hong Kong, so luckily the immigration officers are rather accustomed to people leaving and re-entering the same day, but there is the extremely slim chance that you’ll be rejected. Using a ferry to travel between countries (or SAR’s in this case) isn’t like a taking an airplane. Your ticket states a specific time and boat, but this doesn’t really matter too much. If they can get you on an earlier boat, there’s no confusing process to go through. I walked through the ticket counter and prepared myself to try to find my gate when the one ticket person signaled me in a certain direction. Someone looked at my ticket and immediately started taking me in the opposite direction of my specified gate and ushered me through a different boarding gate. This was happening with other people as well, the boat was about to depart and several people apparently hadn’t shown, so they fit me in, and it all happened very quickly. I kept my fingers crossed hoping I was on the right boat! The views from the boat ride are pretty nice, you’ll see many random islands and countless large big rig ships, after that you’ll see nothing but open waters for a while and then suddenly everyone is spotting casinos; this means you’re about to pull into the dock. The boat ride is about an hour (depending on weather and waves) so you’ll probably be standing in front of a slot machine before you know it. I checked out The Sands, Oceanus, and of course, no visit to Macau is complete without seeing the Grand Lisboa (pictured above). You can see the Grand Lisboa from almost anywhere as it’s the tallest structure around and it’s gold. Random Fact: With an estimated population of around 650,000 living in an area of about 12 square miles, it is the most densely populated region in the world. That averages to a little over 55,000 people every square mile! 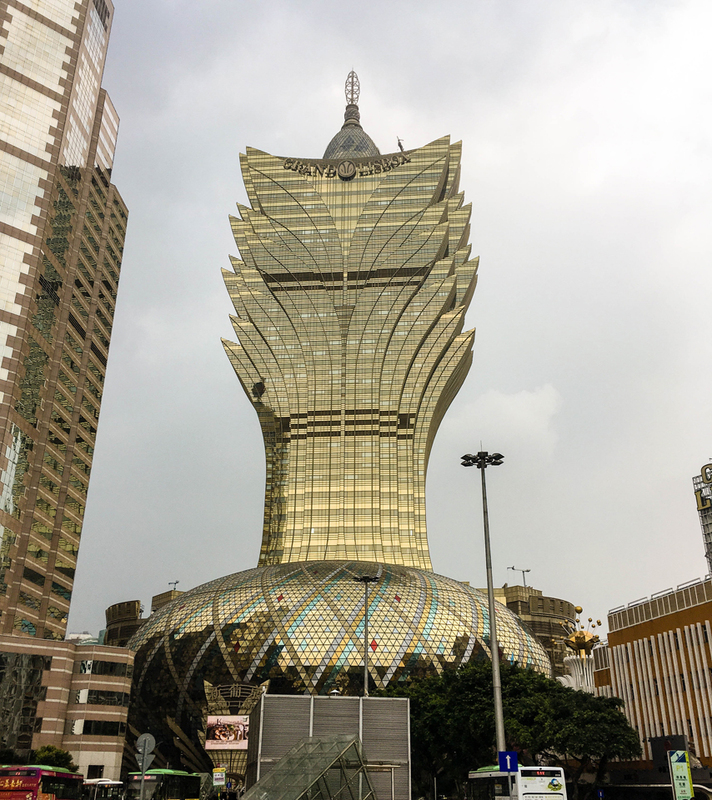 You can visit more casinos if you choose to and if you have more time it might fun to see how crazy they can get, but if you’re just doing a day visit, the only one you really need to see is the Grand Lisboa. Inside they feature some amazing sculptures of animals, forest villages, and ships sailing on the backs of dragons. You may also find a noticeable difference from the American casinos you might be accustomed to (given that you’ve visited any in the USA). While American casinos fill their gaming floors with endless rows of slot machines, Macau casinos focus much more on table games. The reason for this could be to help create more jobs for the citizens here, but this is just a personal guess. I stated earlier that Portuguese is one of the two languages of Macau and you’ll see this rather quickly when you start to look at street names. Or when you go to find a restroom and you may notice signs saying “Public Toilet” in both Chinese “公廁” and Portuguese “Sanitário Público”. However, English is found rather frequently as well due to the high amount of tourism the region has seen over the past decade. Even when there isn’t English though, it still isn’t too difficult since Portuguese isn’t too hard to figure out in my opinion. 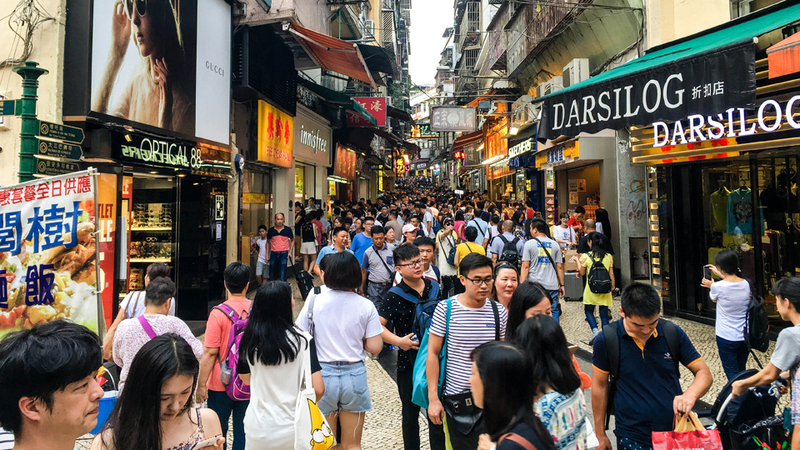 Walking around the country is a preferred method of transportation and while you can get lost pretty easily, you won’t stay lost for long due to the very small size of it; walk in any direction long enough and you’ll hit the Macau border. You’ll also get to experience the strange architecture here as you’ll feel like you’re in Portugal, but all the store names are written in kanji and almost everyone is of Chinese descent. It’s a very strange hybrid experience that I had during my very short time here. 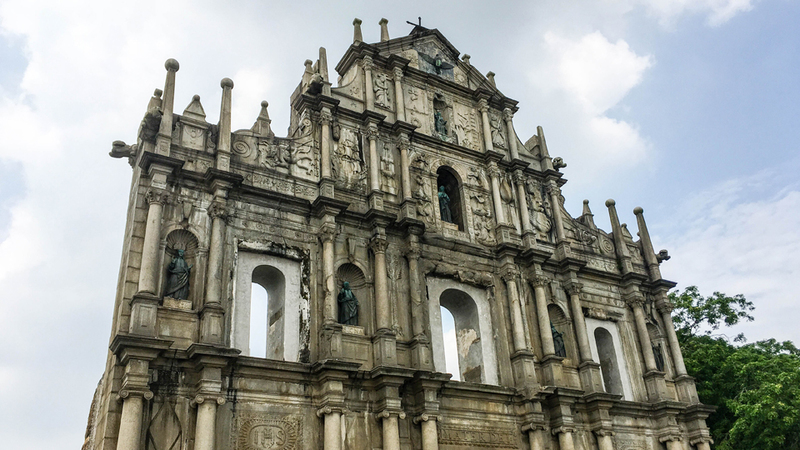 First and foremost; the biggest tourist attraction in Macau is located in Santo António which is the Ruins of St. Paul’s. Construction on this structure had started in 1602 and currently the most intact part that remains is the front wall. The picture of this is located at the very top of this post. The Ruins of St. Paul’s was originally a church and from what I understand was also part of a college. You can also explore the crypt underneath the ruins, however, there isn’t very much to see in the crypt. If you’re in Macau though, this is all free so don’t worry about it affecting your budget! Random Fact: The people of Macau have the 2nd longest life expectancy rate on Earth, right behind Japan. Some other sites to see are the Chapel of St. Francis Xavier which dates back to 1692 and the Museu De Macau which is located on the top of Fortaleza do Monte. At the top of this fortress hill are cannons which look out over the city which makes this a great spot to view most of Macau, however, Macau sadly doesn’t have a great skyline. Its true beauty is seen up close. Another sight to check out is the Macau Tower which stands 1,109 ft. (338m) tall including the spire and is the center of a lot of commercial success. Numerous TV shows have been shot here including Jack Osbourne: Adrenaline Junkie, America’s Next Top Model, The Amazing Race: All Stars, An Idiot Abroad, and even Anthony Bourdain: No Reservations where Anthony Bourdain bungee-jumps off the top floor at 731 ft. (223m). I unfortunately misjudged my time amount and left before having the chance to go up in the Macau Tower; the fear of being rejected while trying to re-enter Hong Kong increased as the sun began to set. I did get to see a lot of the country though by walking around from one spot to the next. As stated in one of my random facts further up, Macau is currently the most densely populated place on Earth. So it’s not uncommon to see streets packed to the brim with people, like this shot below that I snapped. As you may have guessed, I was successful in re-entering Hong Kong as most visitors are. Thank you for reading and check back soon for my article on the often overlooked country of Taiwan, where I explore around the city of Taipei and a bit of the surrounding area! ← Previous Previous post: What Makes Hong Kong So Different? Next → Next post: Why Does Everyone Skip Visiting Taiwan? Wow that is crowded! I’ve heard some tour sites trying to promote Macau as a family friendly destination but I’m not convinced. What did you think? Lol, yea, it can be hard to walk down some streets. I didn’t really notice many family friendly activities, I didn’t see anything I think a kid would enjoy aside from maybe a visit to the Macau Tower. Me too, lol! It was a pleasant surprise to find some interesting culture there! So much cleaner than the rest of China! And its true its the only portuguese colony on the asian side of the world I believe! Next time you should do the bunjee jump its totally worth it! I have an extremely bad fear of heights, it’ll take a lot of courage for me to try a bungee jump, lol! I probably should sooner rather than later though. I want to hit New Zealand, so I might try bungee jumping there, I understand it’s the #1 country for such activities. Portuguese were in Macau for over 400 years under a treaty with China. But there ware Portuguese territories also on Timor (east of Indonesia) and India (Goa, Damão and Dio). As Portuguese discovered the maritime routes to India there was a strong presence on the region but mostly for commercial purposes. very informative post. Macau is on my list with Hong Kong and i would like to spend a night here to experience the night as well. Thank you! I thought about spending the night in Macau, but I had pre-booked my stay in Hong Kong and didn’t see a good enough reason to return to Macau with my belongings and everything. It would be fun though with all the casinos lit up late at night! Thanks! Yea, it’s kind of confusing with the whole China, but not China at the same time, the whole “Special Administrative Region” thing. Seeing Portuguese everywhere in an Asian country was pretty interesting! Wow, you can actually have a day trip to Macau in only 8 hours! That’s awesome. Hope I can visit the places you listed down too. Thank you for reading! Yea, Macau is a pretty small area, it’s worth the trip from Hong Kong though! I absolutely enjoyed reading your post. This is one real insight into a genuine trip and the mess we travellers often end up with time is so common. Macau wasn’t really in my bucket list any time soon but now, I think I need to think about it 🙂 And I didn’t really know about the Portuguese connection. This made my day. Thanks. Thank you! I had been wanting to visit Macau for a while because of the casinos, but the culture and historical sites was a fun surprise! Made the trip much more worth it.